I noticed this improved Digital Airspeed Sensor at AUAV. Might give you better airspeed results. wish they would elaborate on the "single" flaw on more sold to date comment. I'm homing in on this problem, two possible tests to prove or disprove a theory, I'll defenatly post it. You may want to try bringing the flight controller up with the airspeed sensor disabled, initially. Typically I bring up the basic flight controller, trim the system and get a rough tune with the airspeed sensor disabled. Once you get stabilize, FBWA, and then FBWB working without airspeed enabled, you can enable airspeed and retune. The autopilot works pretty well without an airspeed sensor if you fly over a small range of airspeeds. Some commercial surveying drones like the E384 do not use an airspeed sensor. Hi Chad. If your AS sensor is based on the TE Connectivity Measurement Specialties 4525DO then your temperatures are well within the tolerances of the device and would not contribute to the errors you're seeing (the normal, uncompensated operating range is -10 to 85C). If you can, I would try completely removing the flight controller and sensor from the aircraft and test the pair powered solely by a USB connection. Sorry it has taken me so long to respond on this thread. There is a lot to cover in this thread, I'll see if I can hit the highlights in this response. First off, if you want to get back into the air quickly then you can set ARSPD_ENABLE=1 and ARSPD_USE=0. That will enable logging and reporting of the airspeed from the sensor but won't use it to fly the aircraft. Most aircraft will fly fine without using an airspeed sensor under most circumstances. When investigating airspeed sensor problems flying with the airspeed logged but not used can be a very useful diagnostic technique. Also note that you can change the value of ARSPD_USE while flying to enable/disable use of the sensor for flight control during a flight. (hmm, I later noticed you do this in one of your flights). The second thing I'd note is you mentioned getting very large values for ARSPD_RATIO. Anything below 1.4 or above 2.5 is highly suspect and is most commonly caused by an installation problem, usually a kinked tube, blocked tube or positioning of the pitot where it can't get a good reading (eg. not in clear air). the significance of this is that when you see an airspeed on the ground of 3 to 5 m/s that maps to a much smaller error in flight. If we assume an ARSPD_RATIO of 2.0 then an airspeed of 5 read on the ground implies a differential pressure of 12.5. If we were to then fly at 20m/s then that 12.5 pressure error would give an airspeed reading error of just 0.6m/s. I know that you are getting much larger errors than this. I mention it as most reports of airspeed drift don't take this into account. 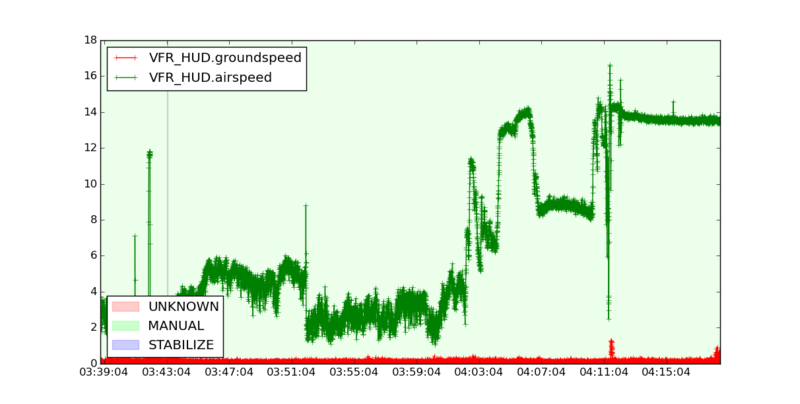 Users are often concerned about an airspeed error on the ground of 3 to 5 m/s, which maps to to an airspeed error at 20m/s of 0.2 to 0.6 m/s. They don't realise that the non-linear nature means that seemingly large ground errors don't map to large airspeed reading errors in flight. Thanks for the pictures of the installation. There are a few things I notice in the pictures that could be improved, although none of them adequately explain the issue. First off, the pitot is too close to the nose of the aircraft. A pitot tube takes a reading of the difference in pressure between two points. One is the tip of the pitot, the other is the static port. It looks to me as though your static port is going to experience a fair bit of airflow from the fuselage. The tip is better placed, but really should be further out, but I think the biggest issue is the location of the static port holes in the pitot. The picture isn't really clear, but I think the holes in the side of the pitot are within 0.5cm of the fuselage, and next to a slanted part of the foam. If you can imagine the air rushing past the nose at that point you'll understand that it will change the pressure measured by the static port, most likely giving a lower static port pressure, which will result in a higher airspeed reading. The second thing I notice in the pictures is the tubes going back to the sensor are way too long and can flop around under G forces in the aircraft. You want those tubes to be secure but not at all constricted. Now on to your logs. I see 4 logs from you. Two of them are for the same flight (a tlog and DF log). The first is 2016-09-17 12-38-45.tlog. 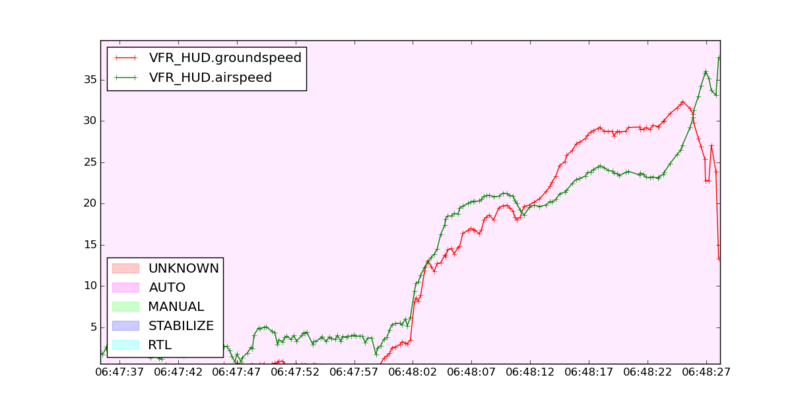 That is a ground test where the reported airspeed goes up to a peak of 16m/s. Assuming that there wasn't actually a lot of wind blowing over the sensor then this is indeed an example of extreme error far beyond the normal range. It doesn't actually behave like temperature drift, which is normally slow. I can see in the log that you redid the airspeed cal at 3:51:49 in the above timescale (in my timezone). That caused a drop in the reported airspeed as expected, but the rise after that is extraordinary. The voltages in the log look fine. A tlog doesn't contain the temperature from the airspeed sensor unfortunately (that is only in the DF log). Your baro temperatures are higher than usual (up to 76 degrees C) but apart from that things look fairly normal. The high baro temperature may be a clue. We normally expect values in the 40 to 50 degree C range. Was it very hot weather? Note that as the aircraft was not actually flying I can't see how the above result could be caused by the position of the pitot tube. I would say that if I saw the above problem happening on the ground then the first thing I would do is disconnect both of the flexible tubes from the sensor. That should give a reading close to zero as the differential pressure should be zero. If it does give a zero reading and it didn't when the tubes were attached then you know it is a problem with the tubes. I have seen extreme examples like this in ground tests when some moisture got into the flexible tubes and created a pocket of compressed air in the tube. I would also systematically turn off or disconnect other devices to see if one is associated with the error. For example, we have seen cases of extreme airspeed error with an early model PulsedLight LidarLite attached to the same I2C bus as the airspeed sensor. I notice you have a rangefinder enabled, can you tell me what sort it is? Let's look at the 2nd log, 2016-10-02 14-41-18.tlog. I've focussed in on just the part where its flying.This log had ARSPD_USE=0, so it was logging airspeed but not flying with it. I'd note that the aircraft starts to get into trouble while the airspeed is reading lower than ground speed. At the point the pitch and roll depart from the demanded attitude the airspeed is reading 24 and groundspeed 30. That is much too fast for this aircraft, and it is quite likely that the very high speed caused it to lose control. There are a few things I notice in the log. First off, it has THROTTLE_NUDGE=1, which means the throttle stick does cause extra throttle to be put in in AUTO mode when above 50%. It kept the throttle up after you dropped the throttle stick though. That may be worth coming back to. I also notice you had ARMING_REQUIRE=0. That is a very bad idea as it disables all arming checks. I don't think it caused the problem, but it will someday. This 2nd log has a corresponding DF log, First Aircraft - Final Crash.BIN. That is useful for diagnostics as it gives us the temperature logged from the airspeed sensor. That shows quite reasonable temperatures of around 33 degrees C. The fact that the temperature doesn't show a lot of variation means it is unlikely to be I2C bus errors causing the bad airspeed readings. On to log3, 2016-10-23 09-29-21.tlog. That one has ARSPD_AUTOCAL enabled, so it is trying to learn the airspeed ratio. The ratio drops all the way down to 1.0, which is much too low. That indicates that the sensor is seeing a much higher differential pressure than it should be seeing. That is normally a problem with the static port (see above) or a kinked or blocked tube. I would not recommend flying with ARSPD_AUTOCAL enabled again until you get to the bottom of these issues. Just set the ratio to 2.0 and leave it there. We can always get the right ratio from a post-flight analysis of a log once the sensor is behaving sanely.It's getting late here and I need to get some sleep, but I'm happy to follow up with you some more on this. We may need to run some ground tests together to see if we can narrow it down. Please read the above carefully and answer the Qs I put in. Prepping, I'll call you about 8-9AM your time. TY!! 1. Temperature that day was only in the 80F range, 76C is about 168F. Here in Texas we do get up to 110F but not that day, I can not account for high baro temps other than the autopilot was directly exposed to the sun. 2. The rangefinder is the Maxbotic I2C XL Maxsonar. It has detailed pics and a fully converted spread of logs for review. Chad and I had a good call today. Looks like a possibility for the high drift may have been pressure on the tubes from other components in the fuselage. Chad will be investigating further. I had a problem like this with a differential pressure sensor a couple years age. Turns out the pressure sensing elements are very sensitive to sunlight. I had hooked up pressure probes to the sensor with transparent yellow, Tygon-like, tubing. In sunlight the yellow tubing seemed to act like a light pipe or fiber optic, exposing the sensing elements to light. Caused odd, bias-like, effects on the sensor outputs. May be a long shot, but you might want to try tubing that sunlight cannot penetrate. So was this ever definitively solved? Chad? I have the same slow ascending airspeed on the ground yet it creeps down to zero while flying, very bizarre. All tubes good, triple checked, everything else mentioned here OK.